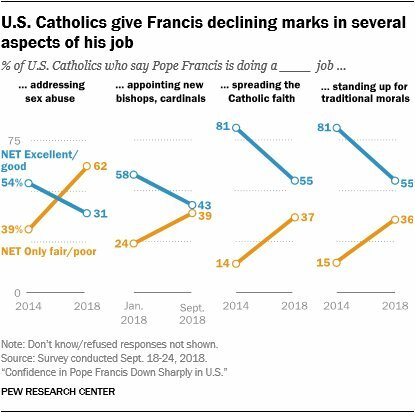 Please, take a look at the Pew poll released just a couple of days ago, in which American Catholics give their opinion on the current Bishop of Rome. It is a much better poll than the usual "approve/ don't approve" type of poll, since it goes to the heart of what a Pope actually does. And it is all the more shocking because it includes all self-declared Catholics, and not practicing Catholics. One can only imagine the view Catholics who go at least to Sunday Mass every Sunday truly think about the current Roman Pontiff.